Wisconsin Badger defenseman Corbin McGuire was named the Big Ten Conference men’s hockey third star on Tuesday. 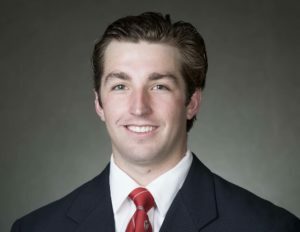 A senior from Ridgefield, Connecticut, McGuire led all Badgers with three goals in a season opening series split with Northern Michigan in Green Bay last weekend. McGuire tallied one goal in Friday and two more in the team’s victory on Saturday. he has now netted five goals in 11 career games as a defenseman after scoring three goals in 56 games as a forward. It is the first Big Ten weekly award for McGuire. Minnesota’s Tyler Sheehy was named the Big Ten’s first star and Michigan goaltender Hayden Lavigne was named the second start of the week.